Being the exception is tempting. When people tell you your first draft will be ugly, you might nod while internally thinking, NOT MINE. Mine will be the exception. And they all kind of know what they’re talking about. I know, I know. But you want to be the exception. You want to go your own way. That’s great. Power to ya! But here’s a crazy idea: Try it. Try writing ugly. I guarantee that you will write faster, you will write more, and therefore you will get in a whole lot more practice. 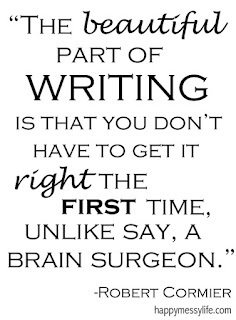 You will then become better, and eventually your first drafts will be the exception. Your first drafts won’t be quite as ugly anymore. Point is, you’re a writer. You need to write. I recently attended an ANWA writing retreat. In two and a half days I wrote 24,823 words. I even won a nifty prize. I was shocked. I never imagined that to be possible. For someone else—anyone else—yes. But for me? And here’s the kicker. Around 20,000 of those words won’t be in my novel. Another novel, or short story? Maybe. I know you might be thinking, what a waste then. 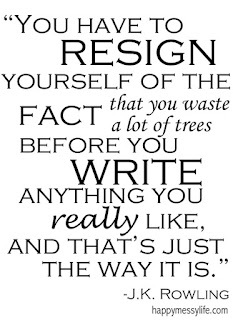 It's tempting to think that way, to turn it into a defeat, but all of that writing was practice. Practice I had no idea I desperately needed. It was around those 20,000 words that I finally found my character’s voice. I found my writing style and now writing is fun again. It’s not painful knowing the words are ugly. It’s almost exciting knowing that I’m a rebel against my inner critic and that I’m writing despite the ugliness. I’m writing! It'll kind of felt like jumping off the high dive for the first time in slow motion: your stomach in knots as you wait in line; staring at your toes and the ground, anything but the actual high dive; the climb to the top; inching your way to the edge; feeling it wobble beneath you; the thought of turning back blaring in your mind; letting yourself fall and the adrenaline rush as you plunge into the cool water; the overwhelming desire to jump again and again. Once you get past the editor in you, you won't remember why it was terrifying or why your fears kept you from doing something so rewarding. You love writing. Bad or good, writing is an adrenaline rush all its own. If you spend 75% of your writing time editing, you’re an editor. Be a rebel against your inner critic. Write. Write ugly. Write good. Write gibberish. 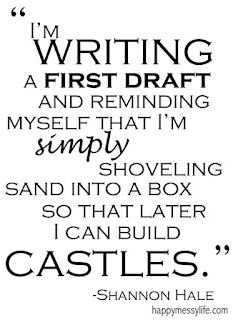 Write that ugly first draft. I love this, Celeste! It's so true! We just need to write! Great job on writing all those words! I'm in awe of all you accomplished! Thank you. I've recently been trying to regain my writing mojo after a difficult pregnancy. This helps.